Folorunsho Alakija (nee Ogbara) was born on the 15th July 1951, in Ikorodu, Lagos State, Nigeria She is Nigerian business tycoon, known for her involvement in the oil, printing and fashion industries. Alakija is the second richest woman in Africa and the richest in Nigeria, the managing director of The Rose of Sharon Group, and the executive vice-chairman of Famfa Oil Limited. The oil and fashion businesses have helped her to increase her net worth. Alakija’s career started in 1974. Have you ever wondered how rich Folorunsho Alakija is as of mid-2016? According to authoritative sources, it has been estimated that Alakija’s net worth is $2.5 billion. In addition to her successful fashion and printing business, Alakija worked in banking as well which generated more money to her account. Folorunsho Alakija is the daughter of Chief L. A. Ogbara, and at age seven, the wealthy family sent her to the United Kingdom for education at Hafodunos Hall in Llangernyw, Wales. She returned to Nigeria and attended the Muslim High School in Sagamu, Ogun State., then went back to the UK for secretarial studies at Pitman’s Central College, London, and also attended the American College, London and the Central School of Fashion, studying fashion design. Alakija launched her career in 1974 as the executive secretary at Sijuade Enterprises, Lagos, Nigeria, but later moved to Chicago to work in the former First National Bank, now FinBank. She stayed there for several years, and then established a tailoring company named “Supreme Stitches”. The business rose to prominence in the coming years and became a household name by promoting Nigerian folklore and culture through fashion. Alakija then formed the company Famfa Limited in the early 90’s, and was granted to explore for oil on a 617,000-acre block in 1993. Since then, her net worth has dramatically increased and is still rising. In 1996, she joined the Star Deep Water Petroleum Limited as a partner, and was appointed as a technical adviser, utilising the strength of umbrella company Texaco, and where she has operated since to significant advancement of her net worth. In March 2016, Alakija became the first female Chancellor of the University of Nigeria. According to Forbes magazine in 2015, she is the 87th most powerful woman in the world. Folorunsho Alakija is a generous philanthropist and has established the Rose of Sharon Foundation that helps orphans and widows by giving them the scholarships and business grants. She also established The Folorunsho Alakija Scholarship Scheme to aid indigenous Nigerians who cannot afford an education. Alakija is also currently the Chief Matron of Africa’s Young Entrepreneurs. 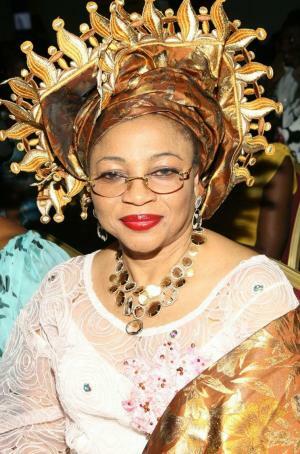 Regarding her personal life, Folorunsho Alakija married the lawyer Modupe Alakija in 1976, and the pair has four sons. Folorunsho and Modupe live in Lagos, Nigeria. Her nephew is DJ Xclusive, the British-Nigerian DJ.